The dry dock was reported to have cost USD $12 million and will be names Peleke Nui which apparently translates as ‘Big Fred’ in the Hawaiian language and is so called in reference to Marisco’s founder Mr Alfred Anwati. Made using high strength Grade 85 concrete, the structure is a hybrid concrete pontoon and steel wing wall. At a height of 15 metres, the dry dock measures 138 metres long and 46 metres wide with clear working space of 36 metres between wing walls. Weighing 15,000 tonnes, the dry dock is designed to lift ships up to 9,500 tonnes and can repair 2 to 3 ships concurrently depending on its size. Using high quality concrete for the dry dock has enabled it to be designed to have a service life of 200 years. Floating concrete structures can be considered as more durable and economical if full lifetime cost analyses are considered. Due to their weight concrete structures can be more stable to operation and offer better weather resistance compared to steel structures which are typically designed for 20 years design life and require regular costly maintenance. 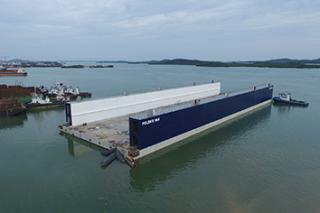 The dry dock took 13 months to build at the construction yard on Batam Island Indonesia, using over 500 local workers supported by an international team of designers, consultants and engineering experts. The construction process included forming a concrete base slab formwork, installing the concrete silos to form the honeycomb system interior, concrete topping and post-tensioning, installation of steel wing walls until pre-launched finishing. After the completion of the structure, 120 air bags were laid to uplift the structure for the eventual sea launch.